This is one of several posts leading up to our day-long Eating Through Time Festival on October 17, 2015, a celebration of food, cookery, and health. View the full program and register for the Festival. 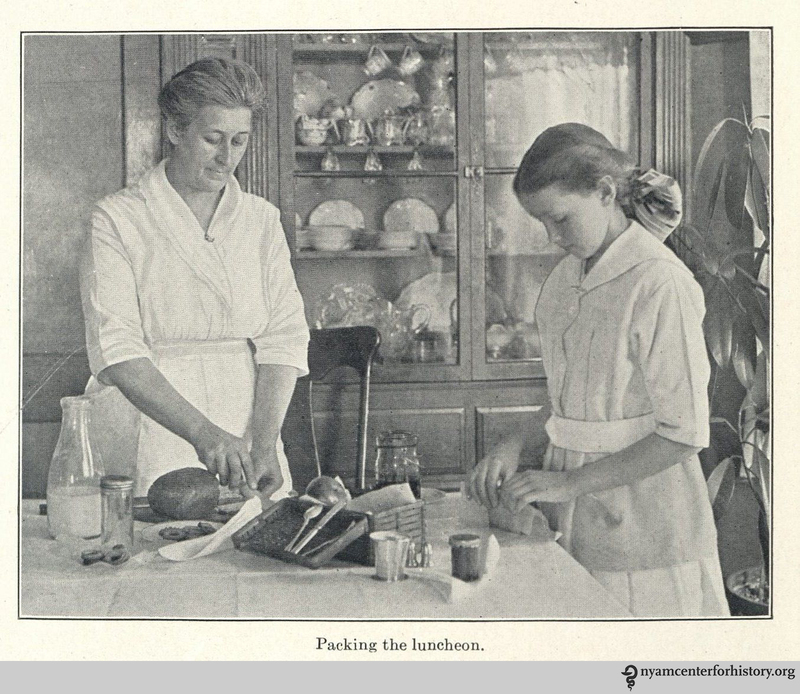 “Packing the luncheon.” In Sandwall, The School Lunch, c1920. 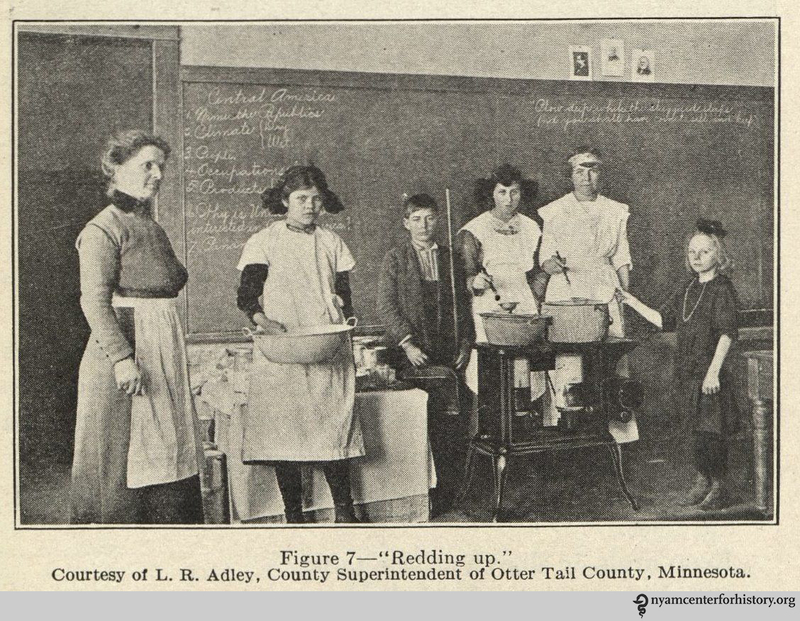 The Rural School Lunch, which focuses on schools in Minnesota in 1916, and The School Lunch, which focuses on schools in Massachusetts circa 1920, both describe the challenges of feeding rural students hot meals long before the advent of the National School Lunch Program in 1946. 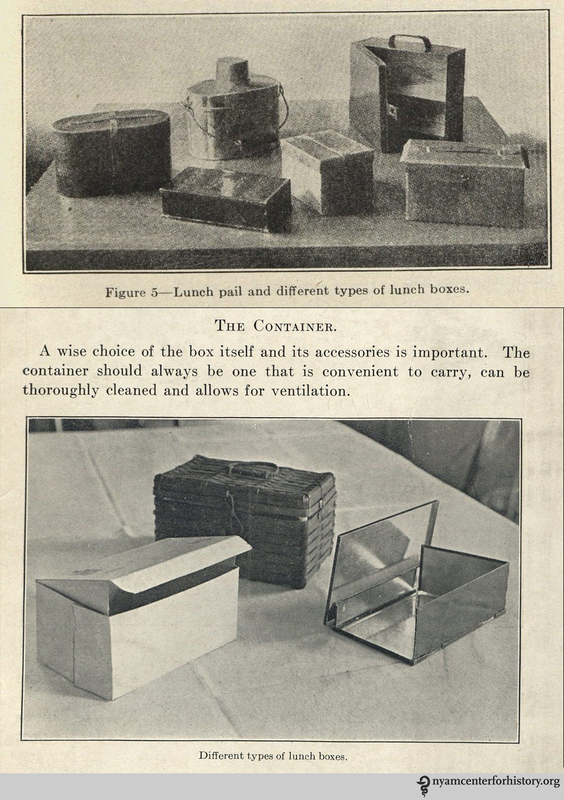 A selection of lunchboxes in Farnsworth, The Rural School Lunch, 1916 (top) and Sandwall, The School Lunch, c1920 (bottom). 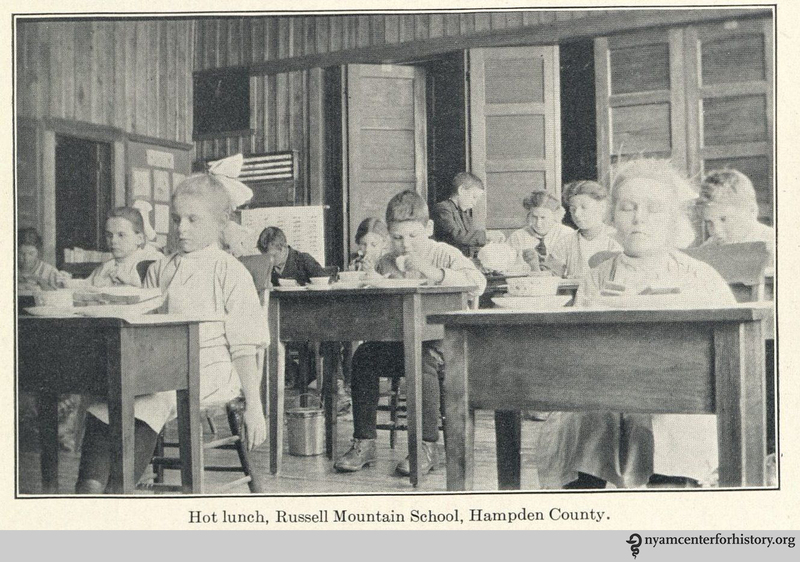 “Hot lunch, Russell Mountain School, Hampden County.” In Sandwall, The School Lunch, c1920. But how could schools provide hot meals to students? Programs across the country varied greatly, and only some had public funding.4 In most places, like the schools described by Sandwall and Farnsworth, hot lunches came about through donations of time and labor. Both pamphlets contain ideas for fundraising to pay for ingredients and utensils, such as food sales or a “shower”: a teacher selected utensils at a local store, asked women connected to the school to purchase them, and turned it into an afternoon party.1,3 And both have lists of recommended recipes, a large portion of them simple soups. 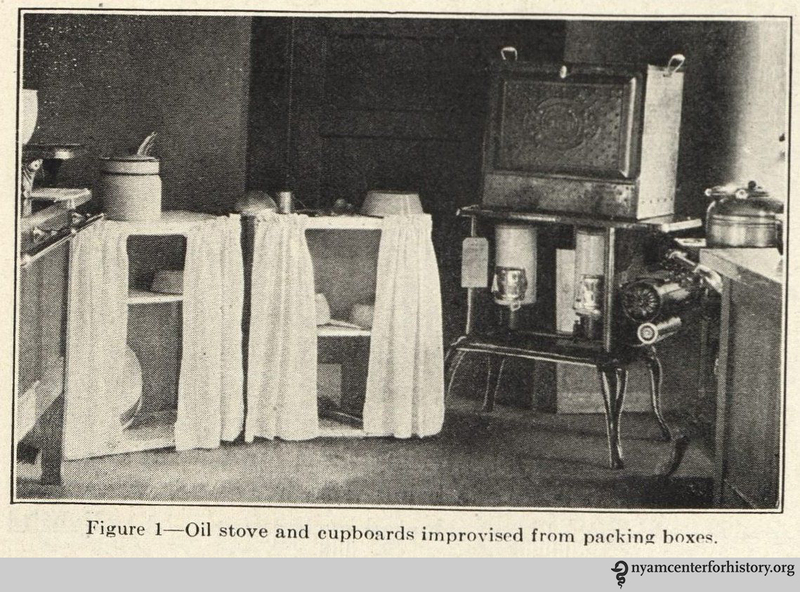 “Oil stove and cupboards improvised from packing boxes.” In Farnsworth, The Rural School Lunch, 1916. “Redding up.” In Farnsworth, The Rural School Lunch, 1916. 1. Farnsworth NW. The rural school lunch. St. Paul: Webb publishing company,; 1916. Available at: http://babel.hathitrust.org/cgi/pt?id=loc.ark:/13960/t9r21q72z;view=1up;seq=7. Accessed August 27, 2015. 2. Gunderson GW. National School Lunch Program (NSLP)| Early Programs by States. United States Dep Agric Food Nutr Serv. 2014. Available at: http://www.fns.usda.gov/nslp/history_2. Accessed August 26, 2015. 3. Sandwall AW. The School lunch /. s.n.,; 1920. Available at: https://archive.org/details/schoollunch00mass. Accessed August 27, 2015. 4. Levine S. School Lunch Politics: The Surprising History of America’s Favorite Welfare Program. Princeton: Princeton University Press; 2008. This entry was posted in Collections and tagged Eating Through Time, food, Food 2015, hot meals, lunch, nutrition, rural schools, school food, school lunch by nyamhistorymed. Bookmark the permalink.